Expert chefs have known it for a long time - by using copper cookware, any meal can be prepared in a perfect and gentle way. 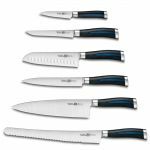 They are the best pots and pans for cooking and roasting. This is particularly due to the fact that copper has excellent material properties. Copper is a perfect heat conductor. The heat will evenly be spread over the cookware and dispensed accurately. 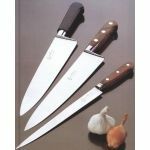 Professionals and ambitious amateur cooks all over the world know what this quality is worth. Minimised scorching risk and considerable saving of energy come along as welcome side effects. Copper has been used and cherished for around 9,000 years. Pots that are made of copper are ideal heat conductors; the material is durable, hygienic and corrosion-resistant. 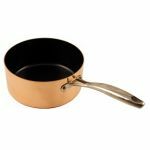 Above all, it is the excellent heat conductivity that makes copper a perfect base material for pots and pans. 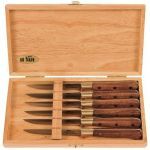 It is widely known that copper conducts heat five times better than iron and even twenty times better than stainless steel. Thanks to the excellent heat conductivity properties, the heat spreads more evenly in copper cookware than in traditional pots and pans. This also reduces the danger of scorching since the temperature can be regulated more easily. As a result, it is possible to cook with less energy. As copper stores heat very well, meals that are prepared in copper pots stay warm longer than those prepared in traditional ones. Copper cookware has an antibacterial effect because germs and bacteria cannot survive on copper. For these microorganisms copper is toxic but to humans the material poses no threat at all. For this reason, water pipes and door handles in hospitals are often made of copper. As a consequence, the transmission of germs can be avoided. On the open market, copper cookware that is sold under this name is not always made of pure copper. Make sure that your copper pot consists of at least 90 % copper and is not an aluminum stainless steel pot with a filmy copper coating that only serves aesthetic purposes but does neither have the heat conductivity nor the authenticity of the original product. 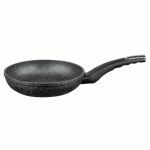 We have chosen two suppliers, BAUMALU and de Buyer, in order to offer you the best copper cookware. Copper pots without coating are particularly suitable for making jam. Jam pots and the so-calles "Poêlon à Confiseur", which pastry chefs use to make syrup, caramel, chocolate, etc. because of their excellent heat conductivity, are not tin-plated. The melting temperature of sugar is at over 180 °C and would damage tin coatings. In order to avoid the formation of verdigris, food should be taken out of an un-plated copper pot after cooking and not left in it to cool down. Copper pots are often coated with tin, which is used to prevent direct contact between the food and the copper and makes it possible to leave the food to cool down in a copper pot. However, the tin plating changes colour over time - it turns more or less grey. The reason for this is that the food is spread unevenly over the entire surface area of the pot. Nonetheless, this discolouration is normal and poses no threat to your health. 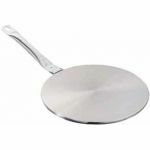 Do not try to remove the stains of your copper cookware with an abrasive sponge since you would destroy the tin plating. Tinned copper pots must never be heated empty on a cooker. As the melting point of tin is at around 230 °C, the coating would be severely damaged. 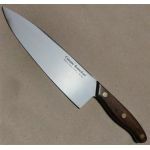 For food that is meant to be roasted or seared, the iron pan Mineral B Element by de Buyer, which we also offer you at gourmet-web.de, is perfectly suitable. 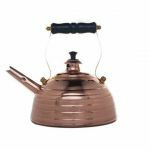 As tin is a soft material, tin-plated copper pots should be treated with care. 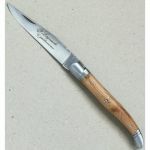 Do not use hard utensils but only cooking spoons made of wood. 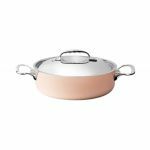 As a modern alternative to copper cookware coated with tin or stainless steel, the company BAUMALU has created the new collection Céracuivre in cooperation with the German manufacturer Weilburger. 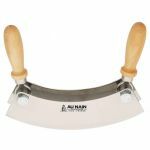 Thanks to its extreme toughness, the special filmy ceramic sealing is not scratch-sensitive, very easy to clean and still grants the cookware all the good characteristics of a traditional copper pot. 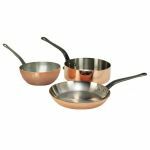 Copper pots and copper pans that are plated with stainless steel are more hard-wearing than tin-plated copper cookware. 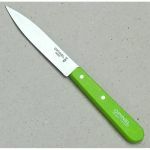 While cooking, you can also use utensils made of metal such as whisks without damaging the pot. The company de Buyer offers the Inocuivre Induction copper pots of the Prima Matera collection, which are equipped with a special, patented ferromagnetic bottom and are, as a result, suitable for your induction cooker. 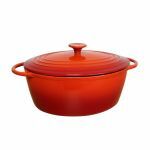 Copper cookware differs from traditional stainless steel cookware to a considerable extent. 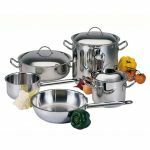 For example, the bottoms of copper pots are not as flat as those of factory-made stainless steel pots and are prone to deforming, which is particularly the case with the thin-walled copper pots by BAUMALU. This is no manufacturing fault but a typical characteristic of the soft material copper. If the curved part of the cold pot points inwards, the pot stands completely even. Should the curved part point outwards, it is sufficient to strike the reversed pot with a fist in order to make it stand even again. The hammering of copper strengthens the material and, in addition, ensures the stability of your copper pot. In principle, copper pots and copper pans can be used on any type of cooker, excluding induction cookers. If you have a cooker with a ceramic glass cooktop, it is advisable to use pots and pans made of thick-walled copper, as they are less prone to deforming when exposed to heat and, as a result, always ensure the contact between pot and cooktop. Should you have a gas cooker, you can also use thin-walled copper pots, since the heat of the gas flame is distributed evenly despite the fact that the material may slightly deform itself. If your kitchen is equipped with an induction cooker, the copper pots and copper pans of the "Prima Matera" collection by de Buyer are particularly suitable for you as they have a special ferromagnetic bottom and are the only ones that can be used on induction cookers. When copper is heated up, its colour changes to different shades. Over time, copper cookware develops a patina. This is a completely natural process and does not have an adverse effect on the food that is prepared in copper pots and copper pans. Since copper is a very soft material, it is scratch-sensitive. Prior to selling it, the manufacturer BAUMALU polishes the copper cookware in order to ensure that it has a mirror finish. 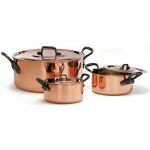 As copper pots are made by hand, it is possible that there are slight imperfections which, however, highlight the nature of this high-quality handiwork and do not have a negative effect on the cooking and roasting properties of the copper cookware. Whenever you do not use your copper cookware, it is advisable to store it in a dry place. 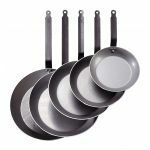 In addition, it is recommended to clean the copper cookware with a special polish paste as offered by the manufacturer de Buyer. Alternatively, you can clean your copper pots and copper pans in the traditional way - by soaking a soft sponge in lemon juice and fine-grained salt and gently wiping the copper with it. Tin-plated copper pots should never be cleaned with an abrasive sponge since this would damage the tin coating. In this case, it is better to clean your copper cookware with a soft cloth.